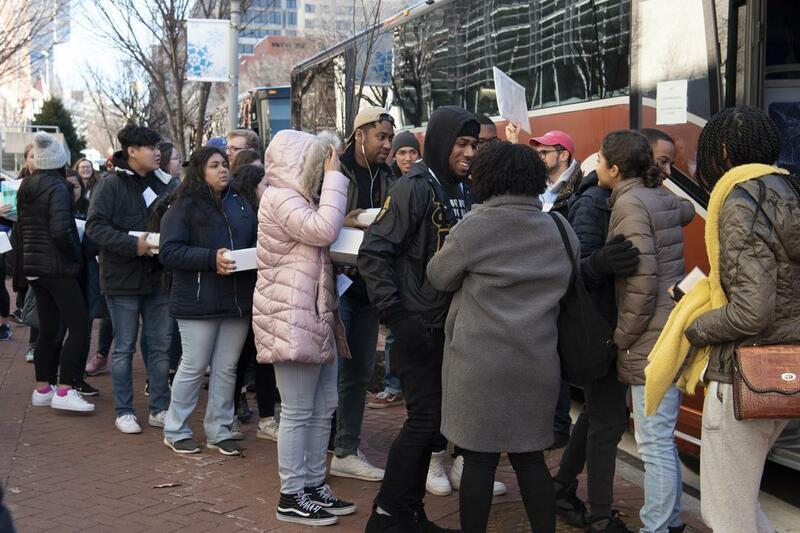 Home GW Community Serves to Honor MLK Jr.
Braving severe winter cold and wind, more than 800 volunteers from the George Washington University and the D.C. area participated Monday in service projects in honor of Martin Luther King Jr. In observance of what would have been Dr. King’s 90th birthday, GW students, faculty and staff, along with other members of the Washington, D.C., community, came together to make a difference with various projects throughout the area. Volunteers contributed more than 3,200 service hours in total, with the largest number of participants the event has seen in the last four years. The Day of Service and Leadership is part of GW’s annual King Week events, celebrating the life and legacy of Dr. King throughout January. GW President Thomas LeBlanc welcomed participants in Lisner Auditorium to the 23rd annual Day of Service and Leadership, saying that he hopes participating in service projects will inspire everyone to live their day-to-day lives in a spirit of service. "As a community that learns together, today is a great day to take the opportunity to put knowledge into action,” Dr. LeBlanc said. “Critical thinking, problem solving, building connections, you will put these skills to use in today's projects. In return, I guarantee you will learn a lot in the process, from each other, from the sites you visit and from the people you meet." Amy Cohen, the executive director of the Honey W. Nashman Center for Civic Engagement and Public Service, said that the struggle for freedom that Dr. King led was firmly grounded in faith in American democracy. She added that people have the power to make democracy work through developing partnerships and working with others because democracy is something that we do. "It feels to me like Dr. King set the greatest example of holding our nation—and the people in it—accountable for living up to the ideals of democracy and freedom upon which our nation was built,” Ms. Cohen said. The keynote speaker for the Day of Service and Leadership was Mary Brown, the executive director of Life Pieces to Masterpieces, an arts-based organization for African-American boys and young men in Washington, D.C. Her message to volunteers was to own their identity and come as they are, continue onward in the face of setbacks and that change is possible when working together. Bundled up to brave the cold weather, hundreds of GW community members spent the holiday serving. In the Marvin Center, volunteers participated in service projects like Jumpstart at GW, which involved crafting literacy activities for pre-school children, and Tragedy Assistance Program for Survivors (TAPS), which included craft projects and letter writing to support families of military members who have died. There were also workshops on Dr. King’s values such as advocacy, leadership and civic development. Off-campus service projects included painting and cleaning at several area community centers and elementary schools. At Walker Jones Education Campus, volunteers worked together to paint multiplication tables on staircases and inspirational quotes—along with the school’s tenets of ready, resilience, responsibility and respectfulness—on the bathroom walls. Site leaders Shantorrian Underwood, a sophomore majoring in Africana studies, and Rose Collins, a senior studying political science, said this service helps in creating the holistic learning experience that the school aims to foster. The K-8 students at the school will be reminded of the school’s standards and continue learning even when walking between classes or taking a bathroom break. Ms. Underwood noted the children of color that make up the school’s student body can sometimes be overlooked in service projects, and this project will reach them in ways the GW volunteers may never know while building relationships with people in D.C.
Ms. Collins noted that along with his teachings on nonviolence, Dr. King also advocated for education. Helping the school with this project also helps in creating the leaders of tomorrow, she said, and all service, no matter what kind or how glamorous, is important. "Service is not about doing what makes you feel good, it's not about coming away from it thinking that you're a great person and that you've done a whole lot for a community,” Ms. Collins said. “It's just really small things that people need, because your service is not about going into there and doing what you think is necessary, it's about asking and doing without putting up a fight."